Jakarta is one of the most populated cities in the world (not to mention one of the cheapest to visit). It’s a bustling, heaving megacity probably better known for its packed roads than its opportunities for some peace and quiet. Yet less than two hours by speed boat from this hazy city lies one of its best kept secrets – the tranquil Thousand Islands. Though the name would suggest there are thousands of islands that make up this remote archipelago in the Java Sea, the reality is there are just 342 – but who’s counting? When you gaze out across the water, it really does look as if there are thousands of emerald islands dotted across the horizon, and there’s one in particular that deserves your attention. Pulau Macan, also known as Tiger Island, is a boutique eco-retreat where relaxation is not only possible, it’s pretty much guaranteed. One of just seven privately owned islands in the region, it’s a place to switch off your phone, kick off your shoes, and live in the moment. Stepping off the boat and onto the jetty, passing beneath broad-leafed trees that cast dappled light onto the sandy path, you’ll notice piles of colourful kayaks stacked to your right, and a palm-roofed lounge bar ahead beckoning you with the sounds of Moby’s ‘Porcelain’. The mood is instantly set. 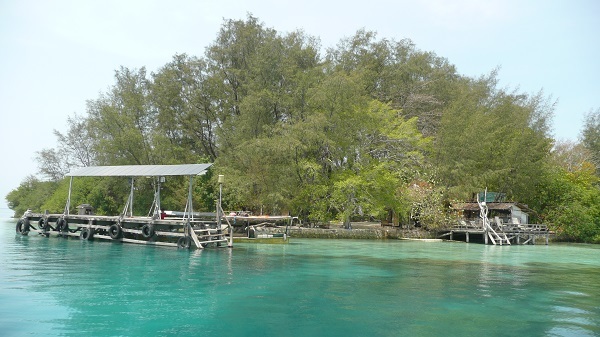 A popular day trip from Jakarta, the Pulau Macan resort sleeps a handful of guests at one time. 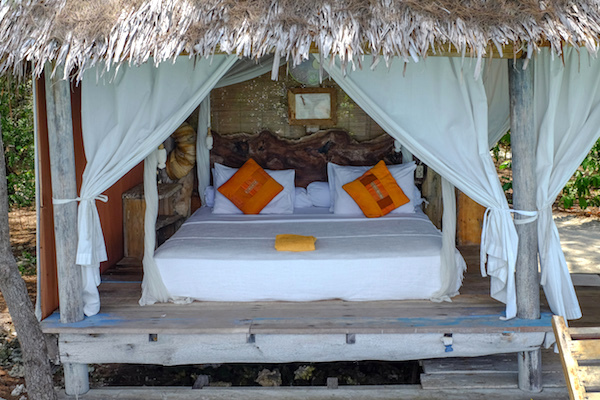 There are six rustic glamping huts, each perched on the edge of the island and angled away from each other for privacy, together with a tropical bungalow and wooden huts for larger groups. What makes the Pulau Macan resort so special is its evolving with the tide. 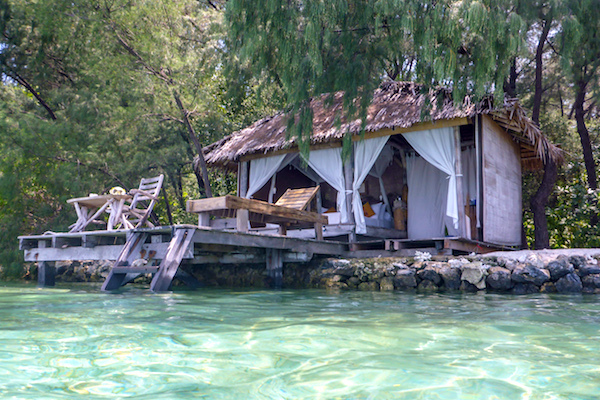 Its accommodations and the furniture within are mostly made from driftwood that has floated up on the island’s shore. 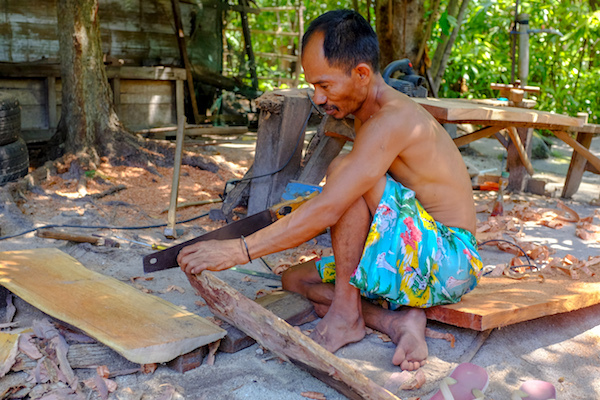 Driftwood is salvaged and stacked up to dry, after which the resort’s resident craftsmen transform it into unique creations. With unique tables, chairs, dressers, mirrors, and even chandeliers, each piece is a one-off, giving the island a real modern-day Swiss Family Robinson vibe. Designed to minimise the resort’s impact on the environment, rainwater harvesting, organic gardens, solar panels, and battery storage are actively used. There are no doors and no windows on any of the huts either, just simple calico curtains that flap in the warm, tropical breeze. 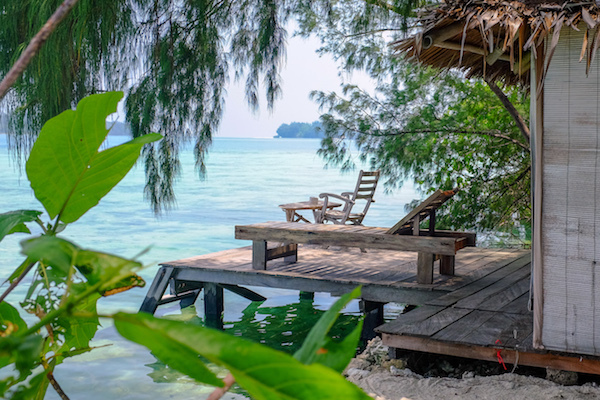 Unlike many of the local resorts, there is no air-conditioning on Pulau Macan – the sea breeze and a small fan placed above the beds are more than enough. Each of the glamping huts features a small private deck and ladder overhanging the water’s edge, so it’s possible to hop out of bed and into the refreshing, unpolluted water in just three easy steps. If you’re concerned about flying insects, don’t be. Mosquito nets are hung around all the beds, with a bottle of insect repellent also conveniently supplied in every room. Though it may be called Tiger Island, there are no giant cats anywhere to be found, though there are giant lizards. Monitor lizards, some over a metre in length, freely roam the island. 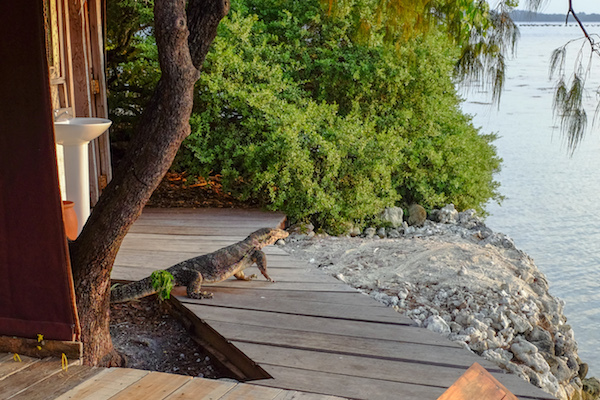 On arrival, guests are advised not to leave any food in their rooms: the lizards can regularly be seen stalking through the undergrowth near the huts, along the pathways, and even on the beaches in search of the fish and insects that predominantly make up their diet. While staying on the island, guests can enjoy authentic Indonesian and international dishes freshly prepared by the island’s staff. Meals are all served buffet-style and feature mostly vegetarian dishes, though there are a few meat and seafood options offered too. 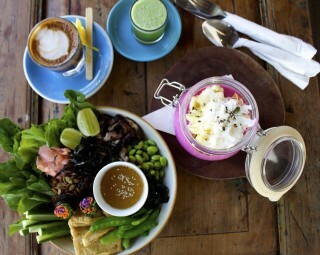 Fresh water, tea, and coffee are all included, but alcoholic drinks will cost you extra. After you’ve spent a few hours lounging in a hammock or in your hut, snorkelling and kayaking are the main activities of the island. You can also rent boats to further explore some of the nearby islands, or even join a snorkelling or diving excursion to one of the nearby reefs. A deserted island just across from the resort is a great spot for a picnic. 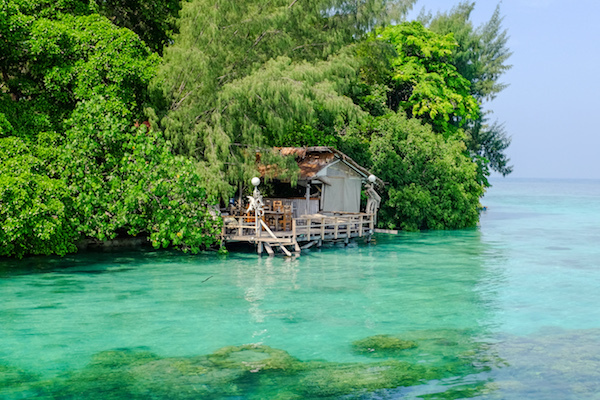 Pulau Macan is a nature lovers’ paradise: an overwater escape for a fraction of the price you might pay elsewhere. Is it enough to hold your attention for a week? 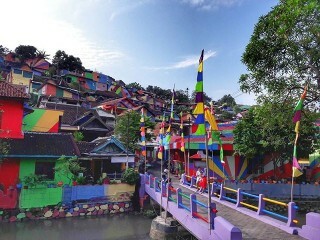 Maybe not, but its location makes it ideal for a night or two at the start or end of your travels in Indonesia. 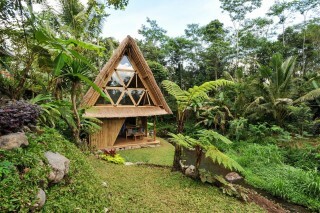 Rates start from Rp2,806,960 (AUD$276) per person for a driftwood hut. For more information on Jakarta and the Thousand Islands, visit the official Jakartan tourism website. 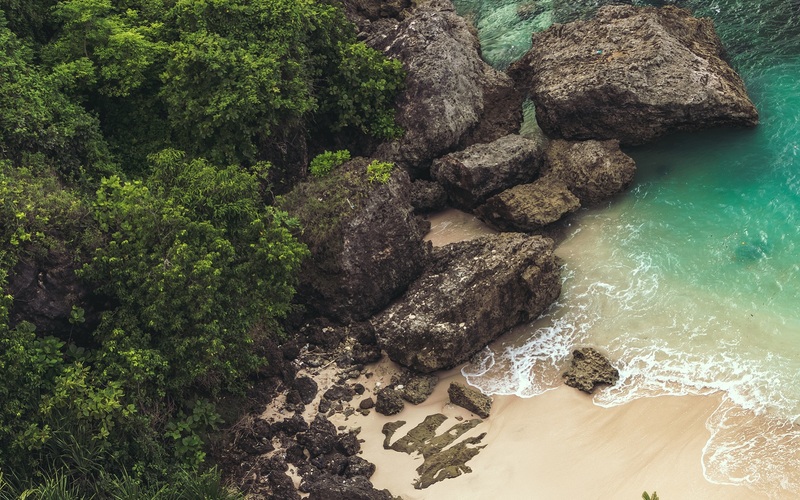 Check out Qantas flights to book your next adventure in Indonesia. The writer was a guest of Wonderful Indonesia.